It’s true what they say. Great things sometimes come in small packages. The same can be said about belVita Bites, delicious mini breakfast biscuits that provide four hours of nutritious steady energy. 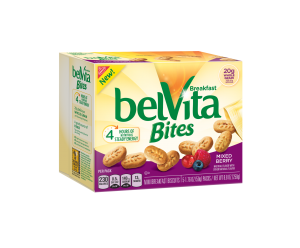 With 42 percent of Americans skipping breakfast due to being crunched for time, the on-the-go convenience of belVita Bites as part of a complete breakfast now leaves breakfast skippers with no excuses. belVita Bites Breakfast Biscuits join the existing belVita crunchy lineup in two flavors—Chocolate and Mixed Berry. Each 50g serving of belVita Bites Breakfast Biscuits contains 230 calories, 20g of whole grain and 4g fiber , and should be enjoyed with a serving of fruit and low-fat or non-fat dairy for a balanced breakfast. belVita Bites are available in retailers nationwide. We’re offering AppforHealth.com fans a chance to win belVita Bites Breakfast Biscuits! Follow these three criteria and you’ll be entered to win. Like Appetite for Health on Facebook. Entries are open until midnight EST on February 16, 2015. I love the Belvita Bites! They are perfect to keeping my desk drawer for breakfast or anytime during the day when I need a little something. Love the taste and the cookie like crunch feels extravagant even though its healthy. They are really good and I can take them on the go. Thanks for the chance! I really want to try them…I think they would be great to keep in my office desk drawer for quick and good for you snack!! I love them because they are easy to make sure I am getting what I nned to get through the morning. don’t have time in the morning for a balanced breakfast. Id love to win them because i love the regular Belvita bars but on the go they sometimes break and crumble so i think the bites would be just that much better! And theyre good for you! Belvita Bites would be great to take with me for breakfast-on-the-go when I ‘m rushed. I’m always on the look out for good on-the-go breakfast ideas, so I’d love to try these! Belvita Bites would be practical, tasty and healthy. I would have them in my purse, the car and at work. Definitely great for the park with the kids. Belvita Bites would ensure they I have enough to start the day. I love the bars, but I think bites would be a little more convenient for eating on the go. belVita biscuits are a good way to start the day and especially on work mornings! Winning would allow me to try belVita for the first time. The regular sized bars seem to be a popular item at my Costco’s and I would love to join in the delicious fun with the bite-sized ones! They would go perfectly with my fresh fruit each morning and it’s great they’re offered in 2 popular flavors! I’m a long-time newsletter reader and Facebook contributor and I thank you for sharing another great giveaway! I love Belvita biscuits, they are a quick, easy breakfast for my kids! I would like to try bites. We eat them on our busy mornings! We already love the Belvita Cookies, but haven’t yet tried these bites. I LOVE LOVE LOVE Belvita. They make the perfect breakfast on the go. Bite sized bars would make it even easier to eat on the run !! I love Belvita biscuits and would love to try these! I like Appetite For Health, already signed up for e newsletter. I am excited to try this due to its an on the go snack but healthy, nutritious and doesn’t need refrigeration or mi,towage and has protein and fiber. It can be stores anywhere and your body benefits from all.Belvita snack bites have to offer. Doesn’t need refrigeration or microwave. Well, I love trying new, better – for – you products. These sound awesome and would be a great, quick breakfast for my family. I keep seeing these advertised and am tempted to try them — Prove to me why I should be buying them! I have signed up for the newsletters. I would like to win this because I am on the go for most mornings and getting to eat breakfast is difficult and when I do it’s normally on the go – these would be perfect! I would really like to win this because I work crazy shifts and I don’t always have time to eat. These would be go for me to take with me. These would be a great snack for me to keep in my drawer at work. I’ve never tried then but would like to. I need to focus on getting breakfast in and this seems practical! I love Belvita products, but have not tried the bites yet. They sound so yummy! They taste great , and are good for you !!! !